Since 1982, we have been traveling in the Greek seas, either participating in sailing races or just cruising for leisure, but always eager to enjoy this never ending learning experience. Learning the ropes, learning the boats, learning the winds and the currents, learning the coves and the harbors and especially learning about ourselves ! 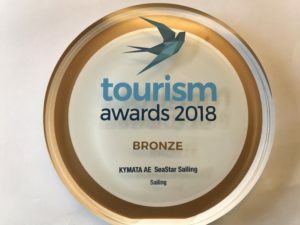 Having accumulated knowledge, memories and insights of some of the most beautiful seas in the world, we founded KYMATA SA in 1990 and started sharing this knowledge of the local waters with a small number of people who have eventually become friends and fellow sailing enthusiasts. In 2017, we decided to expand the circle ! We invested in a fleet of brand new Sun Odyssey 449 sailing boats and we are actively aiming to contribute towards creating a happy holiday experience, which we have named “SeaStar Sailing”, for more families and sailing enthusiasts. Let us be your hosts and enjoy a wonderful holiday ! Boot Dusseldorf 2017 is the most significant event of its type in Europe and as such it represents a big opportunity for KYMATA SA to present in Europe its new expanded sailboat charter activity named SeaStar Sailing. If you are visiting the show, we shall be happy to meet you at our stand no E18 in Hall 13. Please visit us to discuss your vacation plans for a sailing holiday in Greece and allow us to explain the facilities on all the boats of our fleet of brand new Sun Odyssey 449, that are meant to make your holiday a happier and more enjoyable experience. KYMATA SA has selected the London Boat Show 2017 as the launch platform for its new expanded sailboat charter activity named SeaStar Sailing. If you are visiting the show, we shall be happy to meet you at our stand no C011, located right next to the stand of the RYA. Please visit us to discuss your vacation plans for a sailing holiday in Greece and allow us to explain the facilities on all the boats of our fleet of brand new Sun Odyssey 449, that are meant to make your holiday a happier and more enjoyable experience te..
October 2017 was the time for the 2017 United States Sailboat Show. Sailors from around the globe gathered in historic Annapolis to visit the largest in-water sailboat show in the world. The International Charter Expo ( ICE ), which took place in Zagreb in November 2017, is a very special event for the “insiders” of the Yacht Charter business. With Fleet Operators and Yacht suppliers as exhibitors, it had only a few hundred visitors ! Two young professionals joined the company to support its continuing growth. The Dufour Grand Large 382 joined the fleet and was named “Delta”. Many changes (mainly joinery work additions) were designed and performed, to enhance the user experience of its guests. A bigger stand and more meetings with Agents were the two main characteristics of the company’s participation in this most specialist Expo for Chartering that takes place worldwide. The participation of SeaStar Sailing in the Athens Boat Show 2018 ended with great success. The company’s booth, which hosted one of the three sailing boats that were present in the show, caught the attention of the public and attracted a lot of visitors. Spent 4 weeks on a delta yacht. Thank you so much to the whole team of seastar for preparing the yacht and support throughout the journey. Really liked the of of trivia in equipping the yacht. We have felt at home from the first minute and really hope to have acquired new friends in the face of the seastar sailing team. Everything was great. The yacht, the service, the guiding in. Special thank‘s to Takis and his Team for this wonderful experience. If I sail from Athens again, for sure with seastar sailing. We rented SO 449 «BRAVO» for 2 weeks. It was a great time! Everyone was happy! Wonderful boat! Very polite and nice staff! ?? There were no problems!?? Thank you very much! I advise everyone! ? The Best Charter company to face! Thank you takisu and angelike for a great attitude to your cause and approach to customers. New Boats, the right approach to the delivery of the boat, where everything is,, signed, everything in its place and up to the trivia you don't even expect. You will be helped with a travel plan, with emerging questions and circumstances. Takis a man who deals with a case that he likes and does it professionally. Thanks for the rest! what a wonderful sailing on the sea, with all those lovely greek people and perfectly prepared, almost new yacht. have to get back soon. can only reccomend to everyone! We received a very warm welcome from Yiorgos and his team! They have very nice boats, and they are serious about sailing! I highly recommend this team for anyone who is looking for a great sailing experience. The service was above expectations, they really take the necessary time necessary in order to offer you the best journey in the greek islands. Having sailed with “Charlie” of SeaStar Sailing last weekend in Saronikos , we thank very much Takis , Yiorgos and rest of the team , for high quality ultimate safety and great pleasure we got ! Highly recommended for sailing vacation in Greece ! Thank you guys ! We had a great time with SeaStarSailing. We were on Alfa & Charlie. Both boats are in perfect condition, in fact they are equiped like private boats not as a charter. We will be back next year. Thank you Yiorgos!!! The best way to enjoy your sunny days in the Greek sea! A great team that welcomes you and accompanies you every step of the way! Thanks Takis, Yiorgos and Angeliki for making our sailing days so enjoyable! A big thank you to Vassilis, our skipper! Cannot recommend Yiorgos and his Crew from SeaStar Sailing enough. The boat was immaculate and the service provided was above and beyond what you would get elsewhere. 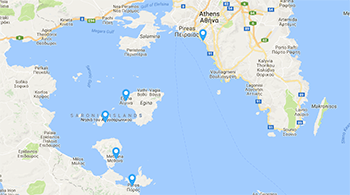 If you are planning to sail in the Greek waters then look no further. As novice sailors Seastar sailing enabled my family to have a holiday experience of a lifetime. From the first contact through until the sailing trip ended Taki and George managed all the fine details in a professional and warm manner. The boat was immaculate , our skipper Vassilis was extremely experienced and safely navigated us through the various Islands. 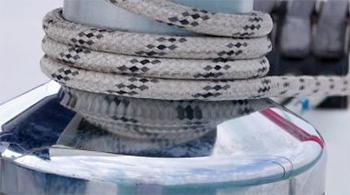 Nothing was too much trouble and we are already planning our next trip with Seastar sailing. Can't thank you enough! Very great sailing fleet. The managers made sure that we had everything we needed during our trip. All the necessities came with the boat but also much more than we could have asked for. A new fleet with great ideas about quality and service. Yorgos values your long-awaited vacation as much as you value it. He is really committed to make your charter time as safe and smooth as possible. 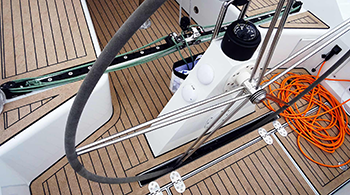 Great attention to details for the boat equipment, with many smart solution that make your life easier when sailing. From the airport transfer we understood immediately that was not the usual service. On top of all this, Yorgos and Angeliki add a great personal and human touch to a great service. Yiorgos and Angeliki are the nicest fleet managers that I have ever met. They made all our special requests possible. Their highest goal was to do everything so we have an amazing holiday. They gave us an extensive briefing about the good sailing spots, harbours and coves for our trip. Thank you so much for this. It was exceptionally great! Such nice people. We just returned from a week with SeaStar Sailing and I have never experienced a service level like that! There were taken so good care of us from the beginning till the end of the holiday. If I could give more than 5 stars I would do it!!! If you want a sailing experience in World class = SeaStar Sailing is your answer! Very very nice, excellent service!! thank you SeaStar Sailing! !